Established in 2001, Sustainable House Day is a national event that showcases sustainable building materials, household appliances and offers a blueprint for sustainable living. This year as part of the annual open homes event, four homeowners in the Northern Rivers will be showcasing their homes and gardens and sharing their stories and tips to create sustainable homes that are comfortable to live in, cheaper to run and better for the environment. “The open day is a great way to meet like-minded people, see living examples of sustainable houses and learn practical, sustainable solutions and information on how to transition toward ‘greener’ living,” Sustainable House Day Coordinator Andia Cally says. Included in this year’s showcase is Elwood Farm in Limpinwood (Tweed Shire), a stunning owner-designed home built with self-sufficiency in mind. The three-bedroom house is made of rammed earth and an array of recycled building materials. The home contains a number of energy-saving features and an extensive edible garden that includes fruit, nuts and vegies, which the homeowners capitalise on year-round, turning them into wine and pickled goods. In Mullumbimby, the Repurposed Shed is a great example of how to upcycle an existing building in an affordable way. The owner/builder from Balanced Earth has given a new lease of life to an 80-year old farm shed, converting it into a gallery and one-bedroom home. It is made from non-toxic recycled materials including Pavatex, a completely sustainable material that provides great insulation properties as well as being vapour permeable with the added benefit of heat reduction qualities. Balanced Earth’s healthy hempcrete home in Possum Creek will also be open for viewing with its innovative energy efficiency features, including underground cool tubes to make the fridge run more efficiently. This low-footprint home won the Masters Builders Association’s Energy Efficient Building Award in 2017, and was built using non-toxic materials such as hempcrete, magnesium board (Inex), natural renders and low VOC paints. Fig House in Bangalow was inspired by a 150-year old Strangler Fig that offers natural shading in summer and a wonderful sense of privacy as well as a welcome haven for wildlife. The solar-powered home offers a multitude of water-saving features, passive design and recycled building materials and its north-facing aspect and outdoor areas allow year-round outdoor living. Why not dedicate your whole weekend to being the change you wish to see in the world? Join in the fun at this year’s Sustainable Living Home Expo at Kingscliff on Saturday and enjoy an all-day program of activities for the whole family to help create more affordable and environmentally friendly homes and lifestyles in our region. The Sustainable Living Home Expo runs from 9am to 3pm on Saturday, 15 September at Kingscliff TAFE and entry is free. For more information on the expo, visit https://www.tweed.nsw.gov.au/HomeExpo. All houses participating in the Sustainable House Day Open Homes event on Sunday, 16 September will be open between 10am and 4pm. Most offer free entry with some asking for a gold coin donation. These details, along with addresses and a fuller description of the sustainability features, are listed on the national website sustainablehouseday.com. The 2018 Sustainable House Day Open Homes event is a joint project between Lismore City Council, Byron Shire Council, Ballina Shire Council, Tweed Shire Council, Nimbin Neighbourhood & Information Centre, TAFE NSW, Self Seed Sustainability and Dorroughby Environment Educational Centre, coordinated by Andia Cally. 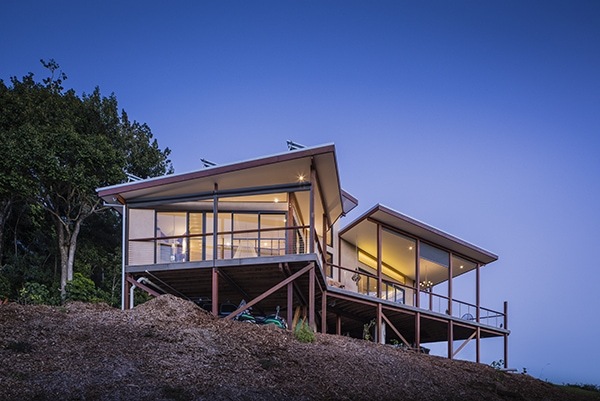 Image: Balanced Earth's hempcrete home at Possum Creek.